Rivendell Theatre Ensemble presents EAT YOUR HEART OUT. Nervous laughter. Awkward pauses. Little revelations. Big fat lies. Playwright Courtney Baron keeps it real. Baron spins the tales of six people trying to be honest. The kicker is none of them can even be honest with themselves. They hide their desire behind a smile, a joke, a barb, or a box of Krispy Kremes. Baron’s characters are flawed humans. Uptight Mary Cross (Alice) wants a baby. She micromanages every detail including her husband (played by Michael Szeles) during an adoption interview. In private, Cross and Szeles snipe at each other. In front of the caseworker, they fake perfection. Under Hallie Gordon’s skillful direction, all the vulnerable moments are equally hilarious and heart-breaking. Cross and Szeles seem to be in opposition. When the unexpected happens during their home visit, we see their marriage through a different lens. Their relationship is being scrutinized by a caseworker AND the audience. Cross and Szeles are so authentic in their interactions that we are completely enthralled in judging them. There is a powerful moment when the ever chatty couple reflect in silence their future. The fear wrapped in tenderness is palpable. And this is just one of the multiple story lines. 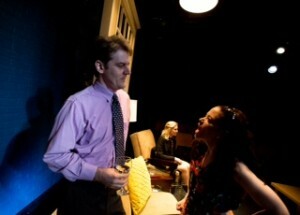 Over at Evie’s house, Anna Joy (Evie) confides in her best bud Andrew Goetten (Colin). Joy and Goetten share quick wit and familiar banter. The self-loathing Joy is being bullied at school and at home. The matter-of-fact Goetten challenges and supports her at the same time. Her attempts to refute his belief in her are gut-punching. All the story lines intertwine with Katherine Keberlein (Nance). Keberlein mismanages her daughter, her date and an interview. Keberlein is impressive delivering icy calculation in one scene and completely melting down in another scene. Her date with the cheerful, geeky Charlie Strater (Tom) has a true match.com vibe. Keberlein and Strater are hysterically awkward in getting to know each other. EAT YOUR HEART OUT masterfully portrays people struggling to be honest with each other. The intense conversations are peppered with abrupt humor. These lives unravel in an untidy heaping mess. The truths revealed are life altering… or maybe not. The unfinished ending was perfect for the imperfection of reality. MINOR SIDENOTE: Scenic Designer Regina Garcia quarters off the stage into four distinct settings. From my vantage point, the cut-out framework suspended from the ceiling in the middle was an unnecessary, visual barrier. When Cross sat down in her living room, she disappeared from view.